Yesterday I met with some of the staff and members of the flower workers union, Uganda Horticultural and Allied Workers. 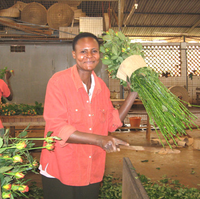 There are 9,000 workers in the flower industry in Uganda on 21 farms mostly in the Entebbe area on the shores of Lake Victoria. 3,000 are covered by union contracts, though not all those pay dues. The union was formed in 2006 mainly through the efforts of Steven Barasa, a long-time flower industry employee who worked his way up into a management position. He was fired by his long time employer because his boss noticed he was too often a workers advocaterequently took the workers’ side in implementing company labor policies. Barasa thought his firing was illegal and threatened to sue. They settled out of court for 7 million shillings. Barasa took the money and paid his rent and kids’ school fees for two years, then appointed himself the full-time union organizer for the flower workers of Uganda. Non-union workers earn between 80,000 to 100,000 shillings a month…about $50-$60. Age discrimination, arbitrary discipline, forced overtime…all the typical practices of non-union employers the world over are found in abundance in the industry. The union has managed to push up the rates to between 100,000 and 120,000 shillings and at the same time build job security, a steward system, and raise job safety issues on the farms. Protective clothing and equipment for workers handling pesticides has been a big issue. So has age discrimination, as employers try to rid themselves of older workers. The union operates out of a tiny office in Entebbe. Barasa travels around by taxi and boda-boda to meet with workers and negotiate with managers. The union is making a big effort right now to train rank and file leadership in labor history, grievance, handling, negotiations, organizing and other union skills. I visited one of the classes last week in Entebbe. As I walked into the hall, I heard the 28 rank and file leaders singing Solidarity Forever. I felt right at home. I gave a little speech and explained the horses on my Teamsters hat and that it was my Teamster pension that enabled me to volunteer my time in Uganda. Later, Barasa took me to one of the nearby farms where the union has developed a mutually respectful relationship with management. I had a chance to chat briefly with some of the workers, and the manager of the farm and to learn a little about flower growing. Everything was coming up roses at this farm. Cute little roses about an inch in diameter with 18” stems…about 7 hectares under cultivation and shipments of thousands of stems each week to Holland. This struggling union gets advice and support from NOTU, the National Trade Union Federation and from the German labor unions which have a support and training NGO in Kampala. After we toured the farm, Barasa headed to Kampala where he was putting final touches on a grant proposal he was sending off that day to potential donors in Germany. The proposal, for $120,000 would let the fledgling organization buy an automobile, some office equipment, allow them to hire an office worker and put two full-time organizers in the field for the next two years. It was deeply moving and inspiring to see this baby union intensely engaged in the work of protecting workers on a daily basis and in building an organization that can improve the lives of thousands of workers and their families for years and years to come.